When I married my husband, I set out to be the perfect stepmom. I went to the conferences. I worked overtime to do everything right for my stepchildren. But I wasn’t a perfect stepmom. I made a lot of mistakes. After more than 20 years, experience has taught me that I don’t have to be a perfect stepmom for my stepchildren to grow to love and accept me. This year, instead of making resolutions about being a better stepmom, I decided to consider a few resolutions on how to move past my imperfections and keep going on days I want to quit as a not-so-perfect stepparent. 1. Remind myself daily that “I can do all things through Christ” (Phil 4:13). Stepparenting is hard. When I try to do it alone, I fail. Thankfully, God wants to walk this journey with me. He will give me the strength and wisdom I need each day if I ask for His help. 2. Let go of the Stepmom guilt. We all experience it from time to time. We let our mind run away with what we’ve done wrong as a stepparent. Or we compare our stepfamily to our neighbor’s perfectly-blended family and let the criticism begin. Stepmom guilt steps in when we expect everything in our home to be perfect. But that’s never going to happen. Why not let go of unrealistic expectations that keep you bound to guilt when you don’t measure up? 3. Forgive myself when I fail. A defeated stepparent doesn’t parent effectively. When I get caught up in negative self-talk over a poor parenting choice, I continue down a negative path. Forgiving myself for less-than-stellar stepparenting moments allows me to begin again with a renewed mind and a fresh perspective on my parenting challenges. 4. Seek out support from other stepmoms on hard days. My neighbor is a single parent with two school-aged children. She recognizes her need for help in juggling her responsibilities and asks other moms to help with carpool or after school care when work demands become overwhelming. We need fellow stepmoms to walk alongside us with encouraging words and support on hard days. If you haven’t found local stepmoms, check out Sisterhood of Stepmom group on Facebook. 5. Listen to my heart on how to parent my stepchild, instead of others’ opinions. It’s easy to run to the phone and ask our best friend what to do when we’re facing a difficult parenting moment, but if we step back and listen to our heart, we make better decisions. Considering our stepchild’s personality as part of the parenting equation also helps tailor our parenting in a healthier light. 6. Nurture my marriage. Stepchildren eventually exit the nest–both of my stepchildren have. Unfortunately, many step couple marriages don’t make it long enough to see that occur. Strong marriages don’t just happen — they require regular nurturing. I want to reach beyond an ordinary marriage by supporting my husband as his biggest fan and most loyal friend. 7. Take time to run, or quilt, or whatever activity works for me to re-group when the stepparenting strain takes over. It’s important to re-group and make time for self-care when we’re about to go off the parenting cliff. When I balance the demands of stepparenting with activities I look forward to, I more effectively handle the strains of stepparenting. 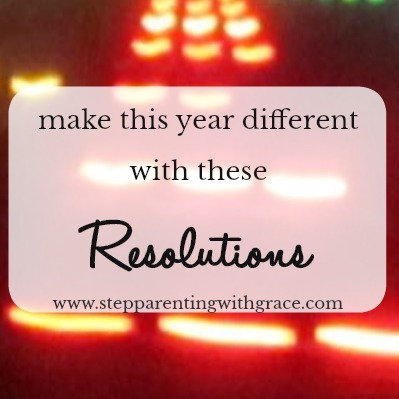 As you start a new year, do you have resolutions to consider as a not-so-perfect stepparent? Do you need a mindset do-over that includes room for imperfection and second chances as a stepparent? Perhaps that’s the ticket to success this year on your not-so-perfect stepparenting journey! Do you have other resolutions to add? Leave me a comment and let me know. 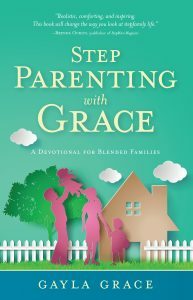 For more support on your stepparenting journey, check out my latest book, Stepparenting With Grace: A Devotional for Blended Families. *A revised version of this article was originally published in Stepmom Magazine, January 2014.